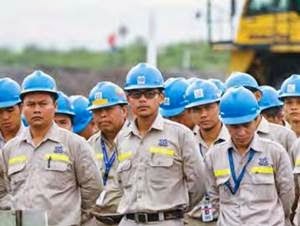 PT Saptaindra Sejati - SIS or referred to as "Saptaindra Sejati" is a well-established and reliable company in Indonesia, based in Jakarta and running business in coal mining industry. The Company operates primarily as a mining contractors and provides an integrated mining service for leading mining companies in Indonesia with international standard. Its business include exploration and drill through mining contract and logistic support. SIS is a mining services subsidiary company of PT Adaro Energy Tbk (ADARO Group), one of the largest public-listed mining groups in Indonesia. As of December 2015, Adaro Group holds 100% ownership of Saptaindra Sejati’s shares. In term of financial performance, Saptaindra Sejati reported total revenue of US$ 432.6 million in 2015 or down 11.06% from US$ 486.4 million in the previous year. Total assets of Saptaindra Sejati in 2015 amounted tp Rp 439 million or decreased 21.6% from US$ 560 million in 2014. This figures was stated by PT Adaro Energy Tbk Annual Report 2015 as cited by JobsCDC.com. Male, not exceed 25 years of age. Civil Engineering, Mining Engineering (Code : DPP Prod). Heavy Equipment Engineering, Mechanical Engineering, Electro Engineering, Electronics Engineering, Automotive Engineering (Code : DPP Plant/Log). Accounting, Tax (Code : Officer / Group Leader Finance). Single, physically and mentally fit. Willing to be stationed in all over SIS site project (Kalimantan Area and Head Office). Never been enlisted as a candidate for PT SIS in between 2015 - 2016. JobsCDC.com now available on android device. Download now on Google Play here. Please be aware of recruitment fraud. The entire stage of this selection process is free of charge. PT Saptaindra Sejati - Fresh Graduate Diploma Preparation Program SIS Adaro Group April 2017 will never ask for fees or upfront payments for any purposes during the recruitment process such as transportation and accommodation.